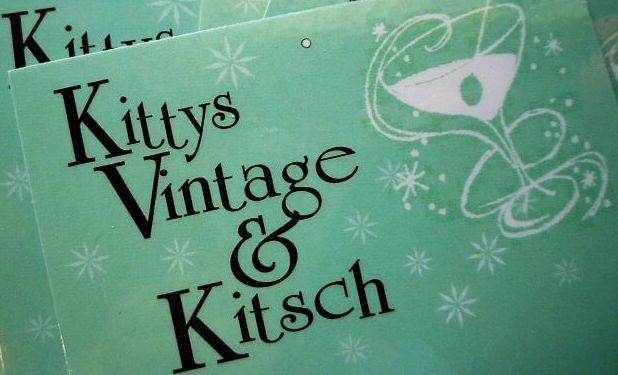 KittysVintageKitsch: What Does YOUR Christmas Look Like?? What Does YOUR Christmas Look Like?? Are you feeling Christmassy yet??? Surely you must be by now, right? I wanna know what your version of Christmas looks like, people!! Do you go in for the traditional red and green?? Or are you more modern?? Do you do fancy table settings? Or maybe, like Sue, you simply " don't do Christmas". Nor that you should make twee cutesy cupcakes...because quite frankly, some of us are getting over bloody cupcakes. But personally I say a good bit of proper Xmas pudding never goes astray, especially when one is already stuffed to the gills with food. This year my family will gather at my mothers' house, and while we are quite traditional with food (lots of nibblies, ham, chicken, turkey, salads), due to our hot climate we largely eat cold food on Christmas day. This includes alcohol, of course :) Drinking starts as soon as we feel like it, which is usually around 9am....champagne of course! Makes us sound like a bunch of roaring drunks, doesn't it, but no, as with everyone these days we're all busy individuals and have precious little time together, so Christmas is the one time of the year we just don't give a bugger, we chop in early! And we won't look like this. It's all casual around here! I daresay I'll be wearing a vintage maxi, but I'll pass on the pudding-bowl haircuts thanks very much. You'd want to start drinking early with a school-marm type like that watching over you, I say. After all that talk of alcohol, the pink milk is looking a bit sickly! It's certainly not a drink I'd ever think of in association with Christmas. This year I'll be doing my usual baking contribution, and as I did last year, I've gleaned a couple of recipes (or ideas for) from bloggers. And on to trees! What does your tree look like?? Do you even have one? Fire-retardant DIY flocking...who knew? Certainly not me...probably 'coz I wouldn't want to know! I'm sure you realise I do enough cleaning and fixing as part of my job to sink a battleship so I'm more than happy to pass on doing any more. 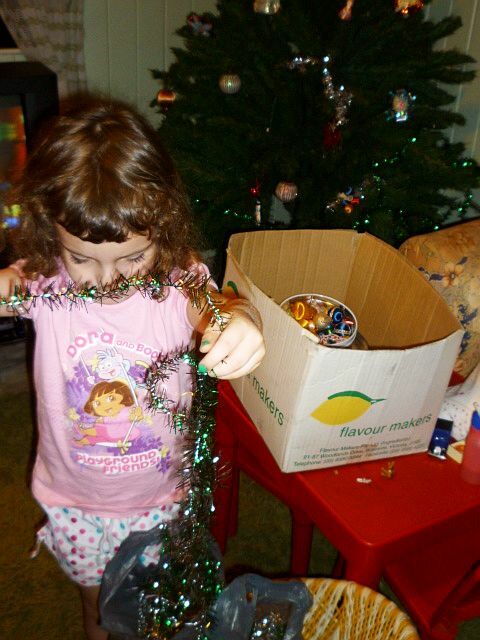 Christmas in my house, such as it is, will look, umm, exactly the same as it did last year. I bought this rather lavish tree and all the 1960s decs from a deceased estate in November last year, and it'll do us for quite some time yet. Eventually I'd like some of those lovely glass baubles like the shiny brites they have in America, but I'll just wait until they come to me. VB and I put our tree up in early December, and while I'm still not sure that she understands what it's all about, she happily helped me put up the tree and did most of the decorating herself. I think she did a pretty good job. Loved every image and yes she did a great job!!! I love those vintage treasures! My Christmas is silver and sparkly and vintage and lit by the fire! I can't wait. Wow, the tree looks fabulous. VB did a brilliant job. I never decorate our tree (a small silver tinsel affair with fluffy pink lights and a fluffy white star - make of that what you will), I leave it to my partner and daughter. We have quite a few home made decs - nearly all made by my daughter too! I don't do the xmas thing,but if I did,it would be wild and vintage and lony and over the top,I suspect!Just gonna get trashed and have some lunch! If she doesn't quite get it yet, she will in a few days!! Christmas is made even better for the kids and the drinks!! Have a fabulous day. Wonderful pictures, Kitty. 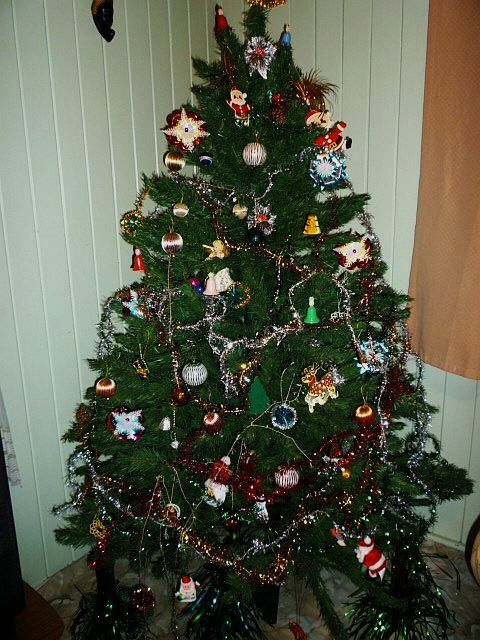 Your tree looks fab, VB did a great job. My kids do ours, then I take it off when they've gone to bed and re-do it. They never even notice! We do the whole traditional dinner thing, but no special crockery, just our usual. We have crackers though! I love you let your daughter decorate the tree! It's lovely. We mix old and new because we have a lot of old ornaments but as they break are replaced with new. I also find letting the girls be extra crafty gives everything a vintage look. Oh I can just imagine my husband's face if I tracked down a flocking machine and announced I was doing the tree indoors! Fantastic pictures. Your tree is looking good, I have a fair few of the glass vintage baubles now, but I need some of those silk covered ones. Pretty tree and inspiring images! I'm a retro holiday devotee, the aluminum tree, reindeer dream pets, and plenty of crazy faced elves make it more merry around my house. VB did a brilliant job, I can see her employed as a window dresser in your shop in a few years time. How cool is her nail polish and fringe, too? She's gorgeous. VB is such a bella like her MaMa. the tree looks amazing . she did a fantastic job. our casita is over decorated and filled with roast dinners and chocolates galore. that's why Im making tamales on christmas Eve.